When it comes to setting up and developing your community group, you and your group members will know what suits your particular needs and local context best, however the following guidance may be useful to consider. Having a constitution agreed upon and in holding is something a lot of groups seek to adopt as good practice, as well as its usefulness in providing a base for any future formalisation – e.g. should you seek to obtain funds sometime in the future. A constitution is recommended for good governance however your group members will know when the time is right to work towards producing one. The first step is usually to establish your group’s mission statement, core aims, and core leadership roles. See below for a basic draft constitution template, which you may want to adapt for your group, as an unincorporated/unregistered community association. The unincorporated model is sometimes attractive to groups starting off as it is not labour intensive, it is a very simple form of structure but provides a basic starting point for building your mandate. It doesn’t offer any liability for its members. This template is just one example of course, there are many different ways in which you can write your constitution. You may also want to consider the different forms that your group could take – if you are interested in providing limited liability for members perhaps you want to be incorporated from the beginning, and if that is the case, then establishing your group as a Scottish Charitable Incorporated Organisation (SCIO) can be a good model to consider. This tool can be used to analyse the quality of decision making and management practices within community (or other) groups and organisations by assessing them against good governance principles. Scottish Government Environment Funding and Grants, information on available government funding sources for individuals and community groups who are engaged in or are thinking about getting involved in environmental projects. Here you will find further links to programmes like the Climate Challenge Fund and the Scotland Rural Development Programme (SRDP). The following presentation was produced by Hannah Braitwaite, Head of Trusts and Foundations at Fauna & Flora International, for the Coastal Communities Workshop (Gartmore 2) in May 2018. Hit play to watch the video! The way in which organisations work together is important but is often overlooked as the focus is on project design and delivery, particularly in emergency situations. However, by considering these issues at an early stage many of the challenges to joint working can be avoided or overcome more easily, and project delivery will be more effective. The following toolkits help groups to identify and categorise stakeholders according to their relationship with the issue or activity and determine what this means in terms of how/whether to work with them; and to identify perceptions of key organisations and individuals inside and outside a community, their importance, relationships, and decision making roles. Particularly now with the current roll out of the Community Empowerment (Scotland) Act 2015, there are increasing opportunities to rewrite the ways in which communities are involved in public decision-making in Scotland. This article from SCDC explains more about the act and you can read more about it’s relevance to coastal and marine groups in the Info Hub here. If you would like further advice and support with any element of establishing and developing your community group then please contact us. Volunteers are a vital resource to many community groups and charitable organisations. 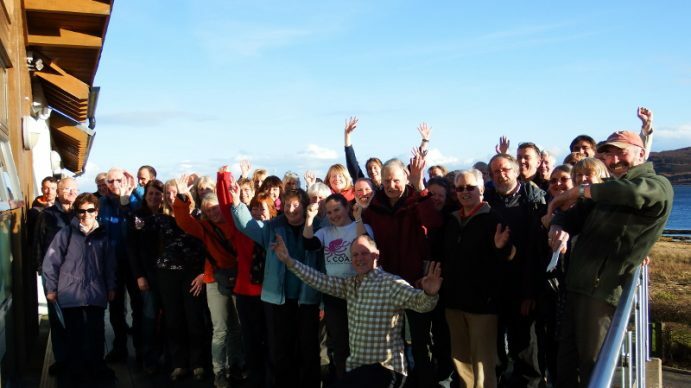 Many of the Coastal Communities Network groups rely on input from volunteers, whether this is seasonal support with activities, long-term help with organisational running, or from voluntary trustees and board members. If you are looking for help with managing volunteers, you may find the template resource pack below useful. This document includes an example volunteer policy and handbook, alongside template registration form, induction checklist and expenses form. This can be downloaded and modified for the specific needs of your group.